Jimmy Earl, CFE, has been named Senior Associate Athletics Director of the Frank Erwin Center by Texas Athletics. Earl is only the third individual to lead the Frank Erwin Center since the building’s doors opened in 1977. Earl was the arena’s first Events Manager and has more than 40 years of experience in the facility management industry. 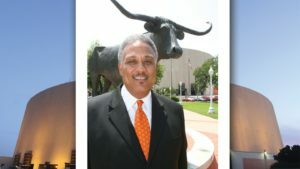 In addition to his experience at the Frank Erwin Center, Earl was the Manager of the Fort Worth/Tarrant County Convention Center from 1987-1990. He is also a past president of IAVM. In 2016, he was awarded IAVM’s Charles M. McElravy Award, which is given to a Professional, Honorary, or Retired member of IAVM who, in the opinion of the Board of Directors, has made the greatest lifetime achievement to the welfare of the Association or profession. He is a 1993 graduate of the Public Assembly Facility Management School at Oglebay, attained the Certified Facilities Executive (CFE) designation in 1995 and attended the Senior Executive Symposium at Cornell in 1997. Congratulations to one of our industry’s true professionals and a leader in every sense of the word! Congratulations and continued great success!